This is the Georgian national dish made from bread and cheese. There are a lot of variations of khachapuri – Imeretian, Adjarian, Abkhazian, Ossetian etc. They can be of different shapes also either round, puffed, or the classic which is in the form of a boat where the dough is formed into an open boat shape and topped with a raw egg and a pat of butter before serving. The classic version of the stuffing is imeretian cheese. 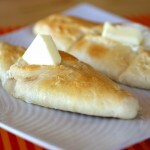 Cook khachapuri in a oven or fried in a pan. My grandmother lived in Georgia and almost every summer we went to visit her. I always have wonderful memories of the city of Batumi where my grandmother lived. Batumi is a beautiful port city near the sea, with many museums, parks, historic buildings and fortresses, churches, famous botanical garden, markets with all kinds of aromatic spices, herbs. 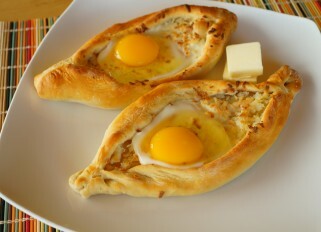 The best Adjarian khachapuri is prepared in Batumi. Almost every morning for breakfast we went to eat them toasted crispy with soft melted cheese mixed with a melting piece of butter and topped with a fresh egg which serves as food and decoration. Unfortunately it’s impossible to find imeretian cheese in the US so replace it with suluguni cheese or bryndza (a sheep milk cheese made in Poland, Slovakia and Ukraine). If you can’t find these you can use mozzarella combined with a little tangy goat cheese. You can made khachapuri with ready-made dough for white bread to save time and without the addition of eggs like I did last time too. I hope that someday I can once again enjoy real Adjarian khachapuri, walk through the old streets of Batumi, feel the warm sun on the beach (there is almost no snow! ), enjoying the aroma of spices and the smell of herbs, eat the most delicious lamb kebab and drink the most delicious wine! Mix the yeast in the water with milk. Allow to sit for 10 minutes. Sift the flour in a big bowl, pour the mix with the yeast, add sugar, salt, and vegetable oil then knead dough. Cover the bowl with a towel and put in a warm place for 1.5 hours. When the dough rises and increases in volume two or three times, knead again and let rest and rise again for 1.5 hours. If you are using ready frozen dough, just unfreeze the dough and leave it in a warm place until it rises. I usually leave the frozen dough in refrigerator overnight and in the morning I put it in a warm place (or just leave in a kitchen) and after 6-7 hours it's ready to cook. Grate the cheese on a large grater. If you are using just mozzarella cheese then add a little salt or mix with a little tangy goat cheese. Make balls from the dough and roll each ball into an oval, about 1 cm thick or less, add the cheese in the center along the entire length and crimp the dough from the edges of both sides in the form of a boat, leaving the middle a little open. Leave khachapuri for 10-15 min, then brush the top of the dough with beaten eggs and bake in the oven at 375 F (190'C)for about 20 min. After removing from the oven, put a piece of butter in the middle of the hole and serve it hot. 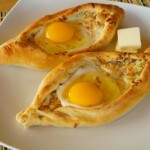 If you want to try khachapuri with an egg on top, take the hot khachapuri from the oven and add the raw egg on each khachapuri in a hole and put it back in the oven for 1-3 minutes. After it's finished then add the butter. 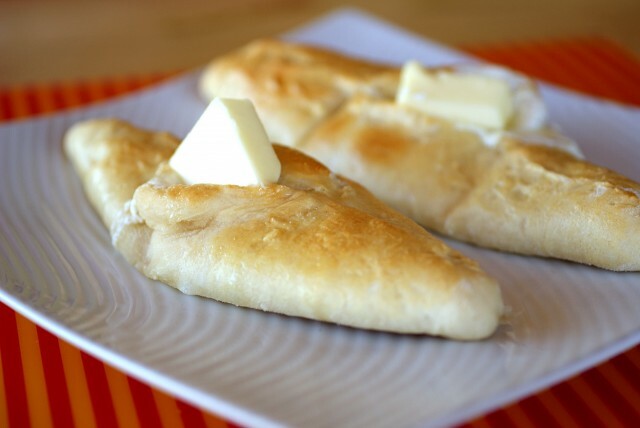 When you eat Ajarian khachapuri you can break off pieces of the dough and dip it in the cheese and butter filling.